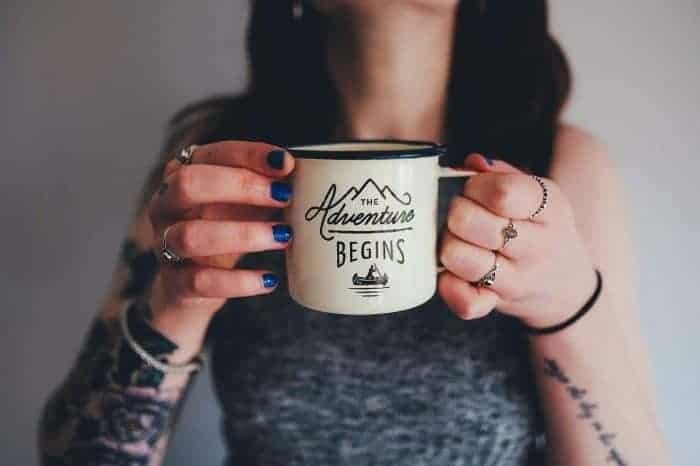 So you have bought your very first vinyl cutter machine, and you have figured out how to cut your first vinyl design. But now what? How do we remove all that excess vinyl so that we are only left with the beautiful vinyl decal? Weeding is a process in which the unnecessary excess vinyl is removed from a design sheet. It can be particularly tricky to remove intricate detailing, especially when working with small designs. Other issues that you might come across include having problems on vinyl lifting from the backing and/or paper tearing in this process. Weeding is indeed an art that you will become better at as you practice. To keep the process of weeding as easy as possible for you, we have decided to share some tips and tricks from our in-house weeding expert. Here is how you weed your adhesive backed vinyl. 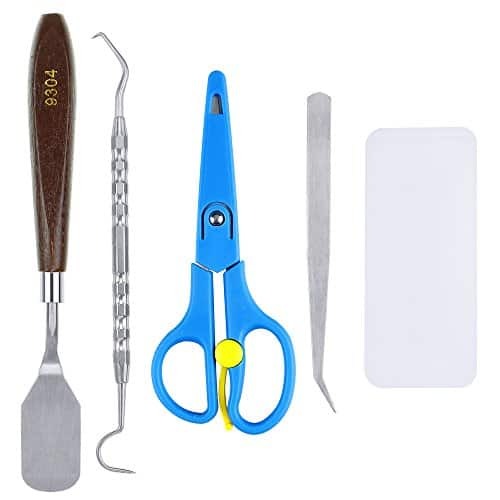 Here is a handy little kit that you can buy with some great tools at a super affordable price. 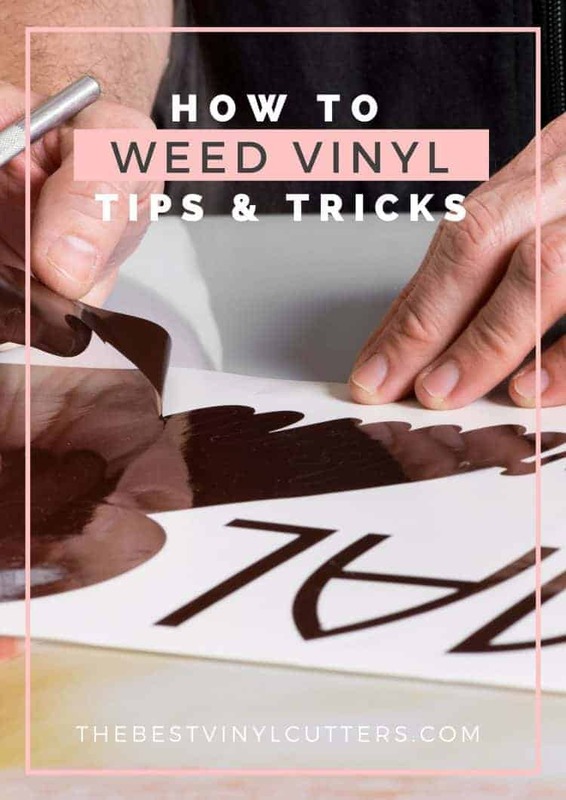 First, you will want to lay your unweeded vinyl reading-direction up (so the words are visible to you) out on a surface that is suitable for cutting. Use an Exacto knife to quickly cut around the design. Remove all that excess vinyl. Next, simply peel away the remaining excess vinyl as you would peel a sticker. We find that it is best to start in one corner and pull down towards the opposite corner. Work steadily and rather slowly to prevent your vinyl design from pulling up as well. Lastly, you’ll need to carefully weed out any openings or separations, which will include holes in letters. Whilst people use all sorts of different tools to do this, we find that the weeding hook does a brilliant job of grabbing those small intricate details. 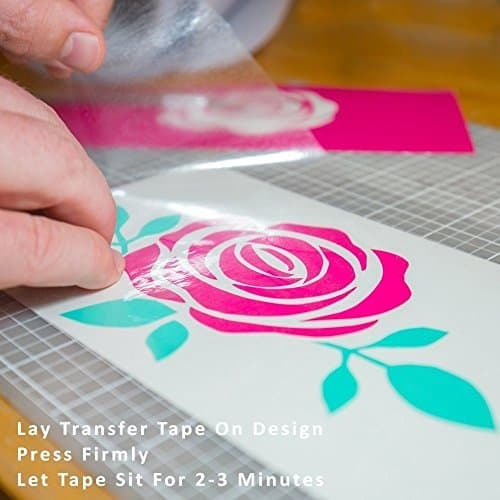 Cover the design in transfer tape, use the scraper to make sure the tape has adhered securely. Leave this to sit for a few minutes. You are now ready to transfer your vinyl on to your item! Tip 1: When working with designs of smaller portion cuts, you could tape out the entire cut to a board or table. (some people love using some clamps as well). This will help keep the vinyl secure whilst you pick out all the small details. Tip 2: Put the vinyl in the freezer for about an hour after cutting. 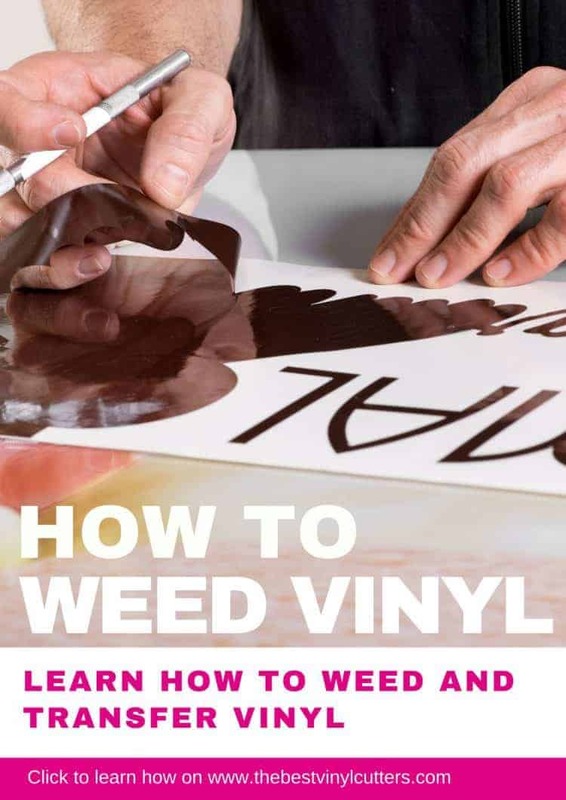 Might sound funny, but it will cause the vinyl to shrink making it easier to see where your design is to do the weeding. Tip 3: If you have a detailed intricate design, make sure to print of your design on paper. Place this picture in front of you when you are weeding so that you can see what needs to be done. Tip 4: If you are a beginner we recommend that you start off with a large size decal that is pretty basic in design. Leave the intricate small decals for when you are more experienced. 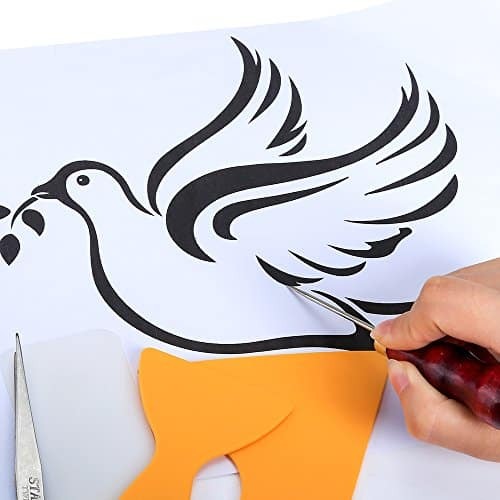 In order for you to apply your vinyl transfer paper to an item, you have to peel the backing off the transfer paper. Then you have to press the vinyl on top of the final design that you’ve made. 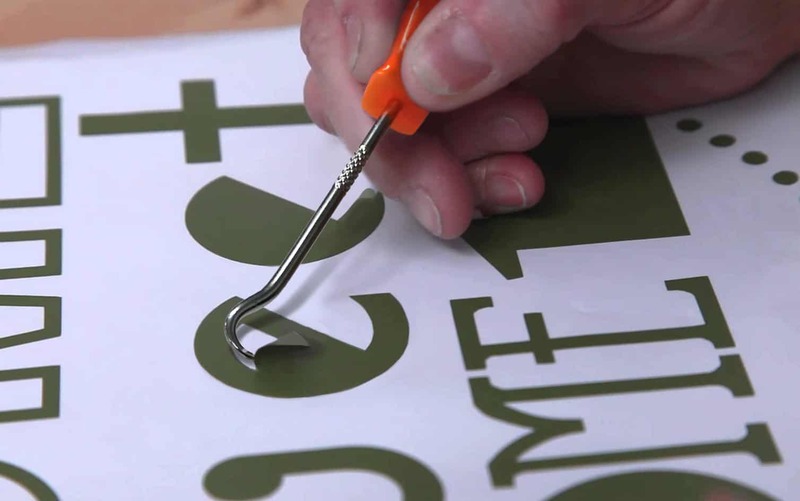 You should know that you can use a scraping tool or something with scrapping or flattening ability so it will make sure that the design is securely attached to the transfer paper and very tightly attached to it. 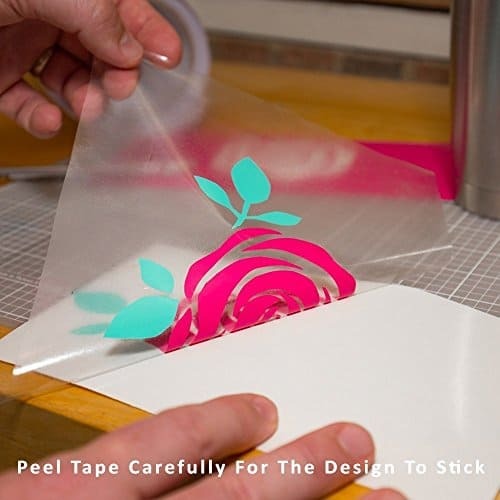 Carefully and slowly peel off the tape from the vinyl backing sheet. You should hopefully peel up the entire design which should now be sticky so that you can stick it to your item. If you have some bits that did not peel up, simply lay the transfer paper back down and use the scraper to firmly rub over that problem area. 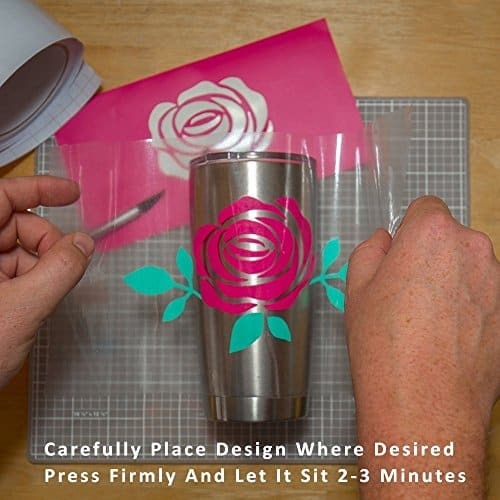 Carefully transfer your design onto the item you wish to decorate. Take the time to ensure that the design is exactly where it should be (is it straight? is it centered? etc.). Once you are happy with the placement, use your scraper to adhere the decal onto your item. Nearly done! Simply grab the corner of the application tape, carefully pull it away, and your vinyl design is complete! 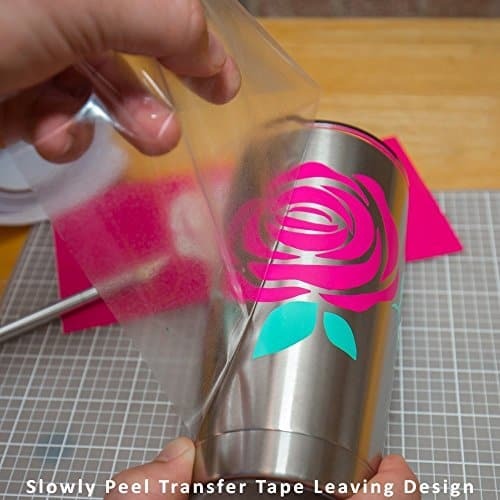 Tip 1: Don’t be stingy with the transfer tape, use a generous amount that is much larger than your design. Tip 2: If this is your first transfer, we recommend you pick a flat item to decorate. Keep the curved items till you are more experienced. Tip 3: If you are nervous, you might like to spray your receiving surface with some application fluid. It will give you more time to play around with the placement of the design (around 30 seconds) before the placement becomes permanent. Tip 4: Poke any bubbles trapped in the vinyl with your X-acto knife tip, and then smooth them down through a sheet of paper. And there you have it! You have completed your very first vinyl transfer. I realize it might have taken a bit of time, but the more you do it, the quicker you will get at it. Why not save these pins for easy reference.